You are expecting a new baby, and so excited!! You can't wait to begin shopping for all of those precious, little baby dresses. That crib set is the most adorable shade of pink. But maybe you should get the one in blue; it could be a boy, you know. Here is an animal print. You love that! If only you could find a coordinating diaper bag… here it is! And there is a matching playpen … and high chair … and a car seat/stroller combo… And then, you hear the angels sing – because IT'S ON SALE!! I love coordinating pieces and I'm all for a good deal, but is that all you should consider when purchasing products for your little one? One major purchase for your child is the car seat. How will you decide which one to buy? Do you base your decision on gender; pink for a girl, blue for a boy? If you already have a child and he or she has outgrown one; is that acceptable? Should you just wait for the baby shower and take what you get? The National Highway Traffic Safety Administration website says the following: “Car crashes are the number one killer of children 1 to 12 years old in the United States. The best way to protect them in the car is to put them in the right seat, at the right time, and use it the right way.” Here is the Child Care Safety Fact Sheet. Which one is the right seat? When is the right time? And, how will I know which is the right way? I think you need to do some research. At first, your infant will ride in the back seat, facing the rear of the vehicle, for better protection of the head, neck and spine. He or she will use a rear facing only, or infant, car seat. Convertible seats can be used rear facing, and then, when your child is physically ready to face forward, can be turned. The next move will be to a booster seat. An “All-in-One” car seat may grow along with a child, but you need to decide if that is the best choice. Here is a chart from Parents Central, a new website from NHTSA. 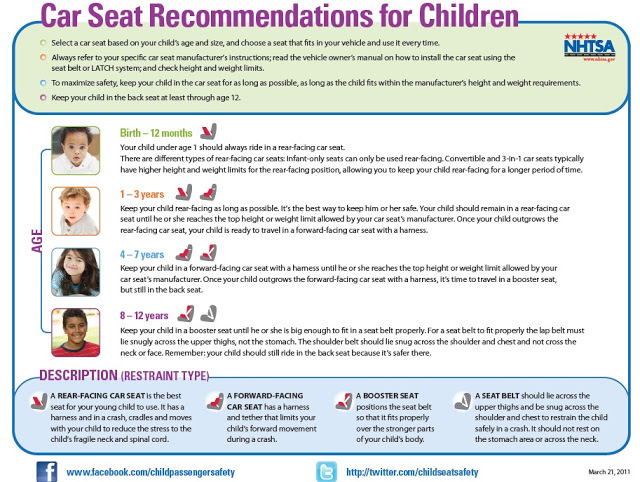 Each move depends on the height and weight of the child, and the height and weight limits of the seat. You always need to check your specific manufacturers manual so that you know its limits and know how to install the seat properly. If you don't have your original manual, look it up on-line. You can usually contact the manufacturer to receive a new one, too. Even if you choose the best rated car seat on the market, if it isn't installed correctly - it's useless. I understand that we are busy parents, and on the run often, but this is a car seat – meant for transporting your child from point A to point B. Yes, children do fall asleep in the car but that seat is not a replacement for a bed. One risk is hypoxia, restricted air flow causing a decrease in oxygen, when the chin rests on the chest. You will find more information here about this topic. Not sure if you are using the seat correctly? Use this Child Car Seat Inspection Station Locator to search for an inspection station where you can get help. The certified technicians can help you install the seat properly and inspect the seat as well, to make sure it is in tip-top shape. Here are some videos on car seat installation which may help. At some point, someone may say, “He is still in a car seat? ?” If he needs to be, hold your ground. His safety is up to you. You know that each child is not a copy of the next. One four year old may not be built like his four year old friend. Check the age, height, and weight! Don't be in a hurry to move them up to the next level too fast, or to skip the seat all together. Want to check the laws regarding passenger safety in your state? 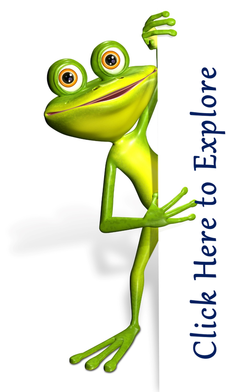 Check out this site, The Governors Highway Safety Association. You can see what the law is for safety seat use and adult seat belt use as well. Should pregnant Mom buckle up? Herbert Hoover said, “Children are our most valuable resource."